Compatible with the latest cars which require a direct CAN connection for diagnostics including all Golf-5 platform cars and latest Audi A3, A6 and A8. 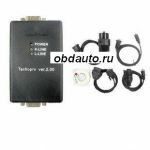 Special function - read/write EEPROM from instrument cluster/immobilizer. All supported clusters CAN/K. such as Altea II and the new Skodas. This is a CPU board for update the tacho universal with older version. For the update, we offer the update software, only for Super Tacho from our official website. Update for free via internet.